Splashbacks are designed to surround your kitchen and add a colourful feel to your home. 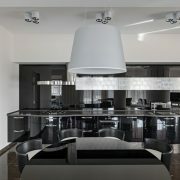 Our glass splash backs are measured and fitted to suit your kitchen cabinetry no matter how simple or complex they are. Have your personal choice from thousands of standard Dulux colours and upgrade to our ultra clear low iron glass to make your chosen colour stand out better. With so many options available, we are sure you will find the best colour to suit with your kitchen. 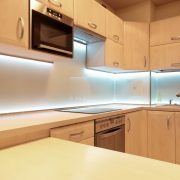 The toughening of our glass splashbacks make it safety glass so you won’t have to worry about our glass being close to your cooktop as long as the minimum requirement is maintained. This also protects the glass from being easily broken if any high force is impacted to the glass splashbacks making it practical for the kitchen environment. We will also make necessary holes and cut outs so that your power points and switches may fit comfortably on top of the glass. Providing quality products to Australian homes!